Early yesterday morning here in Israel, the news flashed of a shooting attack at a concert in Las Vegas. From that moment until now, I have watched the news…watched a shocked Las Vegas begin to understand the magnitude of the attack. I watched the numbers climb, as I knew they would. Twenty dead became fifty; fifty has become fifty-eight. The worst is that each of these numbers has had the “at least” placed in front of it. Over five hundred people were shot (506 according to the last number I saw). I’ve watched people post claims that the shooter was a convert to Islam, watched ISIS claim responsibility. I’ve watched police urge caution and deny that it was terrorism. What they mean is that it isn’t Islamic terrorism because there is no question after watching scenes of the attack, that what I was seeing was terrorism. I know in time, the truth will come out. I also know that no matter how many terror attacks you see, the horror doesn’t seem to lessen. I could feel the terror, the moment when a fun evening turned into a night of terror. But from distant shores, I can see something else as well. There are two elements at work – light and dark, life and death, positive and negative. What you choose, America, may well shape your future. How you react now, will decide what kind of land your children will inherit. For months, I have watched you tear yourself apart. I have been shocked more times than I can count at the anger, the hatred, the poison that I have seen. Part of the poison could be seen in Hillary Clinton’s tweet “Our grief isn’t enough. We can and must put politics aside” – which is a great message, if she had not then gone on to say “stand up to the NRA”. That’s politics, Hillary. The guns this murderer, this terrorist used, have been banned since 1985. There was nothing legal about what Stephen Paddock did today and no law that would have changed the outcome. Joe Biden doesn’t even attempt to call for unity. He writes “Congress and the White House should act now to save lives. There’s no excuse for inaction.” Under his watch, at least 227 people were murdered in such mass shooting attacks. But the hypocrisy of leading Democrats is not what I want to write about – that is just part of the problem, the sickness that has plagued America and continues to plague it. Instead, I’d rather focus on what happened today outside the spotlight of those who have yet to understand that democracy demands you accept the results of an election. They understood it and were horrified that Donald Trump did not vocally agree that he would honor the results and yet, once they lost, they have spent so much time and energy doing exactly what they were worried Trump would do – undermining the fabric of America. Instead of focusing on them, let me tell you some of the stories I heard today as I listened. As thousands of people ran for their lives, Uber taxi drivers realized they were needed. Several drove to the area, picking up people and taking them away without charging them. One taxi driver picked up a man that she thought was drunk, only to find out he’d been shot and was in shock. She drove him to the hospital, and then returned to help others. Her meter remained off. That, America, that is what you have to celebrate today. Within hours, as massive amounts of injured people were taken to five different hospitals, doctors and nurses were struggling to get there to help. Running at full capacity, they put out two calls. They needed more blood; they needed more trauma doctors. I saw a report of a doctor flying from California to help, others came as well. And lines to donate blood were so long, they had to tell people to wait for hours. That too is America. “This will galvanize us, this will not tear us apart” said the Channel 3 news anchor. And he was right. At first, people were dropping off cases of water to help those who stood outside the concert area desperately trying to find loved ones. Long after the people had left either having found who they were looking for or to continue to local hospitals to search there, people were still bringing water. The news had to broadcast it wasn’t needed, but cars were needed to pick up what remained of the water to take it to the blood donation sites. And so people in cars came, loaded up and were told where to take the water. And this too is the America you should think about. America was attacked today. Whether it was a home-grown psychopath or a recent convert to Islam, the result was a terror attack. Perhaps not Islamic terror, but terror nonetheless. It was not a random attack. It was planned to the finest detail – what guns he would need, how he would break the window, what room he had to rent, what time to initiate the attack. You have the choice, America, to pull together or to break into pieces. No matter the motive, the outcome is the same. Violence has always been part of the problem; but more and more, people think it is the solution. The basics are in place – you have a strong society, a nation of good and caring people. Be strong, America. Fight back against the negatives. There are so many coming at you from so many directions that I worry about you as I never have before. The values that will save you have not changed in more than 200 years. Your enemies fear you so long as you cling to those values – freedom and democracy are your treasures and your greatest weapon. But so is tolerance and love. Stop the hate, America – not only that which comes from foreign shores. 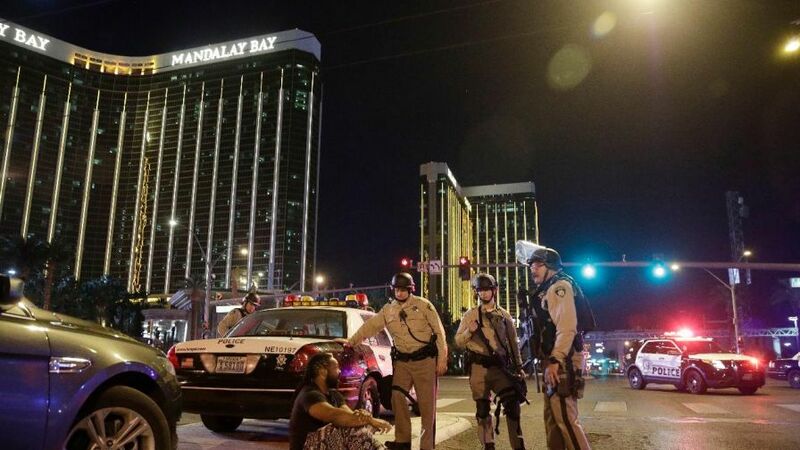 I don’t know who Stephen Paddock was, why he chose to do what he did. Maybe he was crazy. Maybe he was anti-Trump. Maybe he was pro-NRA. Maybe he was a convert to Islam. In the long run, what counts more than the moments under fire, are the days and months and years to come. In this area, one of the most significant elements of the 9/11 attack was not the belief of the Muslims who perpetrated the attack, but of how America responded. As one. United. Determined. Answer Paddock. Answer the politics. Answer ISIS. But most of all, America, answer for yourself. Be strong and turn back before you allow anyone to destroy you. Unite, America. Start by uniting to support Las Vegas. Start by accepting that Donald Trump is your president and if you don’t like that, in three and a half years, work hard to change it. But for now, stop the media from feeding off your weakness. Be determined, America. Determined to save your democracy, to save the country you have built, the land you believe in. Be strong, America. Answer hatred with love; answer death with life. The doctors and nurses in Las Vegas are struggling to save the lives of more than 500 people. It’s your job to save the lives of over 300 million. Save America. Be strong.